March 23, 2019 The Scalpel paint project is nearing the end. Some logos and sponsors names and she'll be done. Can't thank Steve Ojeda, Hot Rod Walt, Roy Garren, and House of Kolor enough for their help and support. We're really pleased with the Scalpel's outcome. House of Kolor products are just incredible and second to none. The car is scheduled to be shown at several major car shows throughout the year and hopefully a Canadian race next year to show it's true kolors. Stay tuned. Feb. 10, 2019 Well the news finally came down on the 2019 L'Ultime Descente Speed Challenge, the event is cancelled. The word from the Canadian group is they ran out of time to proceed with the event. They also commented that they would let the gravity speed racing community know no later than the fall of 2019 IF there would be a 2020 event. Doesn't look good for future events in our opinion. Where does Bodrodz go from here? We are now looking at the possibility of a streamliner build for the Bonneville Salt Flats. We'll keep you posted. Dec. 9, 2018 Work continues for Bodrodz teammates around the world. Gravity bike rider, Stef Cree of the UK, just finish another incredible gravity bike build for the 2019 season. Steff once again proves he's one of the top GBike builder's on the planet. Fast Donnie's new body construction for his gravity car coming along nicely. The Bodrodz Atomic Scalpel has a new look for 2019. Doug Anderson just finished coloring the Atomic Scalpel and is now ready for lettering and stripes to finalize the project. As for the announcement of a 2019 Canadian event, no word yet. Nov. 12, 2018 Fast Donnie gives a sneak preview of his new body for 2019. Fast D is using the one off mold-less construction technique for the build. The Scalpel still in the paint shop getting new color and lettering. Oct. 10, 2018 BXGR is proud to welcome Steff Cree who will be representing Bodrodz in 2019 for a WGSA gravity bike record and to set the record for a new class, Speed Scooter. Steff is one of Europe's top gravity bike designers/builder/riders. We're looking forward to an exciting year with Steff. July 2019. The team is looking to raise the WGSA top gravity streamliner record and get Andy Ash into the WGSA Century Club. 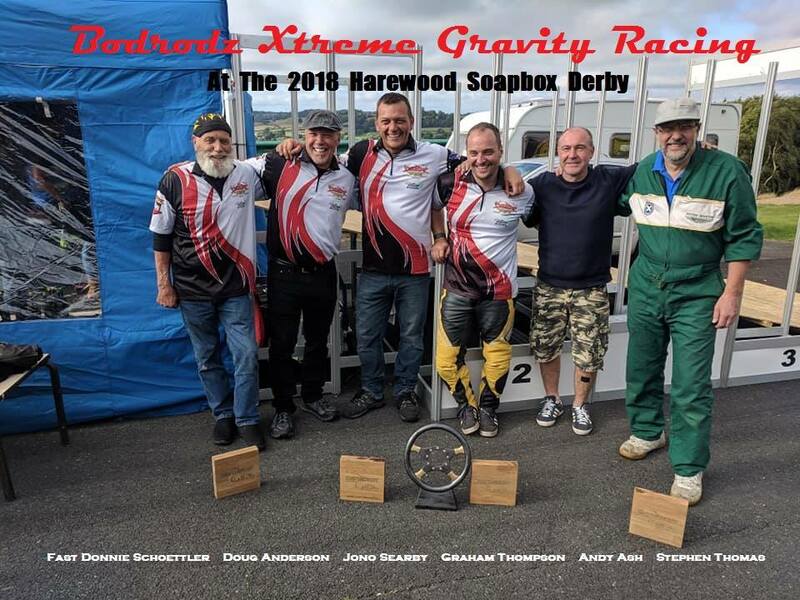 Aug. 21, 2018 Team Bodrodz was back together at the 2018 Harewood Soapbox Derby held in Yorkshire, UK held August 18.. It was great to see some of the team back together. Doug Anderson and FastDonnie Schoettler flew in to compete in the SpecKart class. This is a one design class which has which offers up incredible head to head competition. Anderson and Schoettler would finish 6th and 7th in the A finals. Bodrodz Andy Ash would win the SpecKart race and in doing so won the 2018 SpecKart championship. Bodrodz crew members, Jono Searby and Gramham Thompson, would crush the competition in gravity sidecar and win the 2018 Gravity Sidecar Championship. With Graham piloting and Jono taking care of the monkey business, this was their third championship. meeting all the teams and people at this incredible event. The 2018 Harewood Soapbox Derby also raised more than 10,000 pounds for charity. Hoping to make it back next year. BXGR would like to thank everyone who made the Harewood Soapbox Derby such an awesome race. May 20, 2018 FastDonnie Schoettler has moved his West Coast Bodrodz gravity car operation from Southern California to Bend, Oregon. He's extremely pleased with his new location and is busy getting the new shop up and running. Watch for a new G Car soon. everyone and the car generated lots of interest. It was lots of fun and we've been invited back for next years event. Apr. 22, 2018 The Bodrodz Atomic Scalpel will be on display at Summit Racing Equipment Motorama Saturday April 28 - Sunday April 29 at the Atlanta Motor Speedway. The car will be displayed in the Million Dollar Salon. If your at the show pleases stop be and say hi. Apr. 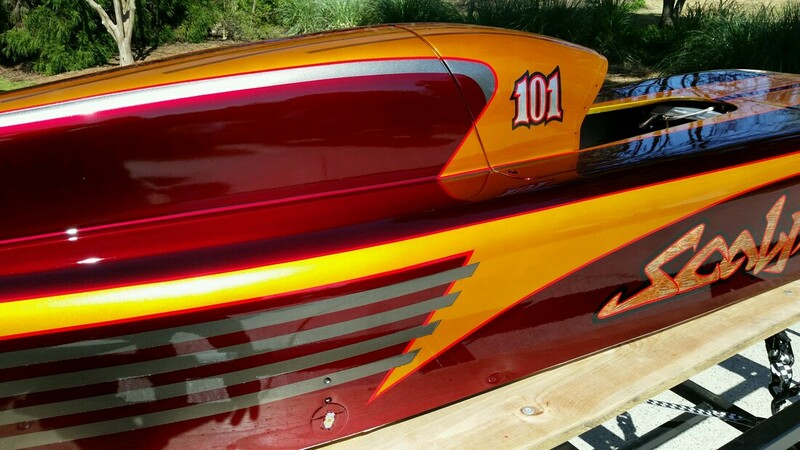 20, 2018 BXGR has been busy working on the new streamliner for a 2019 world record attempt in the WGSA 200 CWC class. Great news! Scott Holsenback is healthy and will be back in the cockpit of the new streamliner for the record attempt. Scott will be defending his world record for that class which was set with the ill handling Bodrodz Bullet. Scott has his sights set on WGSA Century Club membership with the new streamliner. Dec. 21, 2017 2017 is just about history. No doubt the greatest year ever for BXGR. Three new WGSA world records with three brand new gravity cars, a new member into the WGSA Century Club, and three new members to join BXGR. We are looking forward to 2018 with Bodrodz jumping into the gravity speed bike arena and hoping to go after four WGSA speed bike records at the 2019 L'Ultime Descente Speed Challenge. Work will continue on the Scalpel with some aero mods and a new streamliner body will be fitted to the Sliver. All of us at BXGR, would like to thank everyone for their support and following us in 2017.